It's time we talked about Ebola. It's been in the news a lot and for good reason it's one of the deadliest diseases humanity faces—the second-deadliest, technically. It's making a stand in West Africa plus for the first time two US citizens with the disease has been flown home for treatment. However, don't bar your doors and windows, get yourself rolled up into some kind of 2006 Bird Flu Hysteria because we've met an Ebola before and we're learning more about it than ever. 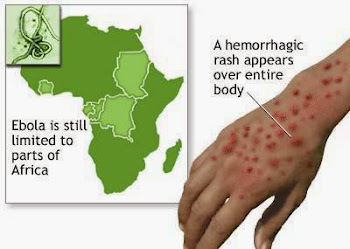 It used to be known as Ebola Hemorrhagic Fever or recently an Ebola Virus Disease. So, what the media have lately been referring to simply and sometimes hysterically as Ebola is really one of at least five known species of the Ebola virus. But they're referring to is the most dangerous species known as Zaire ebolavirus (Zebov), named after the central African country where it was first discovered in 1976 along the banks of the Ebola River. It’s on the news because it has infected more people this year than it has any other year since that first outbreak. So far, in 2014, it had infected 1,323 people and 729 from it have died. The virus has moved into some west Africa's major population centers including countries like Guinea, Liberia, Sierra Leone and possibly the Nigerian capital in Lagos. How Dreadful is Ebola Disease? It's newsworthy for sure and for plenty of reasons according to the World Health Organization, Zebov has an average fatality rate of 83%. However, in some outbreaks it is killed when a 90% of the people infected. Ebola is a type of hemorrhagic fever which means one of its most prominent symptoms is heavy bleeding, either internally or externally. But blood loss isn't what kills its hosts. After causing flu-like symptoms like vomiting and diarrhea, Zebov targets the entire circulatory system causing blood vessels to fail blood pressure to drop and eventually all the major organs to shut down. Let's check our heads for a minute for one thing. Ebola is definitely contagious but it's not as easily transmitted as like the flu. It's not an airborne disease, it's only contagious by infected people who are exhibiting symptoms at the time and even then it can only pass through close contact with bodily fluids. That’s why most people who are getting infected are health care workers working in pretty austere conditions or family members of patients who treat their loved ones at home, and prepare their bodies for burial. But being on the same airplane or in the same hospital ward as an Ebola patient doesn't mean you'll automatically been exposed to the virus. In another little glimmer of hope, it turns out that some people have developed a natural immunity to Ebola. A study in 2010 found that more than 15% of people in the West African country of Gabon carry antibodies for the Zebov virus even though there is no record of an Ebola outbreak there. Researchers think those people were exposed to the virus over decades probably through fruit that had been contaminated by bats—which are the original carriers of the disease. But instead of getting sick these people just developed natural defenses. A Possible Treatment for Ebola? It’s not sure why, but as you might imagine there's a lot of scientific interest in the people of Gabon right now. Of course, there's no vaccine for Ebola. However, many prototypes are being developed. Last year was a breakthrough in this effort. Biologists in Boston found that cells treated with the kind of compound called “Indoline Alkaloids” block the ability of the Zebov virus to replicate itself. These alkaloids are the same class of chemicals that give many plants their medicinal properties. The problem is… Science hasn’t figured out why they work or how to turn them into an effective Ebola treatment. Thank you for reading Facts About Ebola — A Deadly Disease Humanity Has To Face posted on the website Kwentology if you want to redistribute this article please include the link as the source. Have some kuwento to share? Contact us!